Picture Frames and Photo Mounts by Cadremont. All our news and views will be displayed here. Our friends over at The Image File website recently called us to let us know of a new service they are offering both new and existing businesses, that either want a new website or maybe you have an old website that could do with a refresh plus some new features. They have been creating websites for UK based photographers since 2000. We understand how busy creative professionals are and that redesigning or creating a website from scratch can be overwhelming or time-consuming and therefore often remains at the bottom of the to-do list. That’s why we have created a solution that is supremely easy and cost effective to get your business online. With the Website Build Service, we can create you a professional looking website for just £90 + VAT. Once you have supplied a little information about your business, along with some images, our expert designers will start work. Within five working days, we will have a site created for you to approve, allowing you to create, upload and showcase your work. It really is that simple! Here you can see more of their existing sites. If you have a got a favourite they can match your design. Sometimes when we send our mounts and frames out of the door , we often wonder where they will end up. We have had a mounted picture frame given to Barrack Obama and some work was sent into the Arctic circle. So it is safe to say we don’t have a clue where they will end up. So, last week it was interesting to get an email from a customer who works for a charity. Graham mixes his artwork with his charity work. He was at a Festival when he was told to expect a ‘visit’ from the Patron of the festival. She usually attends with her ‘other half‘ but this time she was on her own – apart from her security and equerry. “However during her visit she became enthralled by the mounted ‘breakers’ artwork we are selling. She spent around 10 minutes making a selection to take home to give to the Grand Kids”. Not sure what the Royal protocol is but Graham says she insisted on paying the full amount for them. She was in the tent looking at Graham’s work for a full 20-30 minutes. Grahams background is very interesting , he has been a charity volunteer for Oxfam for over 30 years, both as a voluntary shop manager in Leeds and also as a National Product Development Manager for Books and Bookshops. He promoted the utilisation of illustrations from distressed books and period advertising from magazines and other ephemera etc and over the last 15 years has supplied books to, built and trained over 100 bookshops. Ill health meant Graham has had to slow down a bit over the last year or so but he continues to volunteer and build shops and select the stock and run the shop with other volunteers at Hay. Says Graham “Business has been fantastic of late including the work Camilla Parker Bowles aka The Duchess of Cornwall purchased which was a selection of ‘breakers’, including comics, Eagle, Hotspur, Lion, all mounted and backed using Cadremont products….the same that Camilla bought”. This year will be the 10th year Graham will be at the festival and is hoping for record breaking sales – we wish you well Graham. We like to help and support any business , so if you have a story, event or some news you want to help ‘get out there’. We really want to help you do it. Just contact us via the contact page and lets talk. If you are looking for similar picture mounts to the ones Graham uses, then please click on the link below. If selling work commercially we have found that artwork sells easily if it has been mounted, and a back added to it and is sealed in an acetate bag. This means it is kept totally clean, dust free and ready to be put into a frame of your customers choice. We obviously dont know where the artwork ultimately ended up, but as long as the person who gets it as a gift is happy and the person who sold the artwork is happy – then we are happy to. If you like to really push your creative limits, then maybe you should consider throwing your hat in the ring for the ZEISS Photography Awards. The ZEISS Photography Award (now in its 3rd year) has issued the call for any ambitious photographers anywhere in the world to put forward their work around the theme “Seeing Beyond – Untold Stories” to the international jury of experts. Dont let that put you off though – everyone starts from somewhere. The basis of the series should be about stories that have not yet been told or rather finished. “Untold Stories” should be interpreted in the widest sense – the works can examine the familiar from a new perspective or cover topics that have not received much attention up until now. The goal is for photographers to push the creative boundaries and surpass themselves photographically. Basically – anything goes, the more different and unique the better. The ZEISS Photography Award is jointly hosted by ZEISS and the World Photography Organisation. For example in 2017 approx 4,700 photographers from 132 countries submitted more than 31,000 photos. Photographers are asked to submit a series of 5 – 10 images, including a description of the images, online. Entries close February 6, 2018 – so you will need to act fast. The winner and the shortlist will be released on April 3rd. The winners will all get attractive prizes, including ZEISS lenses of their choice with a total value of 12,000 euros as well as 3,000 euros to cover travel costs for a photo project. The awards ceremony will be held in London on April 19, 2018, as part of the Sony World Photography Awards. The winning works and chosen photos from the shortlist will also be presented at the Sony World Photography Awards exhibition in Somerset House, London, with the winner participating in the exhibition opening. Also, ZEISS will invite the winner to the company’s HQ in Germany. Here they will gain insight into the world of ZEISS and can familiarise themselves with ZEISS lenses. In addition, they will also have the opportunity to personally work with ZEISS and the World Photography Organisation – not bad. 1.2.2 The ZEISS Photography Award is open to all Photographers entering a body of work between 5 to 10 images. 1.3 All entrants must be over 18. 1.4 By entering the Competition You hereby accept these Competition Rules and the Terms and Conditions. 1.5 Entries must be submitted by 12.59:59am (GMT) on Tuesday 6th February 2018. 2. To enter, you must upload your image via the following website: users.worldphoto.org (the “Website”), following the on-screen instructions carefully. Un-published work entered into the competition must have been taken between the dates of January 1st 2014 and February 6th 2018. Once unpublished work has been entered, it cannot be entered again as published work in the future year of the awards competition. Published work may have been taken at any point in history, but must have been commissioned or acquired or first published between the dates of January 1st 2014 and February 6th 2018. Eligible publications include magazines, newspapers, on-line and print editorial, self-publishing websites, including personal sites as well as commissioned gallery exhibitions. Images included in past photographic competitions, advertisements, marketing material, blogs, social media and all other visible platforms prior to January 1st 2017 will be considered published and not permissible within this competition. All images must be saved in the RGB colour model and EXIF data must be left in the image file. All entrants must be able to supply a high resolution image suitable for printing in exhibitions should the image be required. 3.1 Entries will be judged between in February 2018. 3.2 In addition to one winner the judges may select up to three finalists in the Competition. 3.3 One winner will be notified by email and will receive return flights to London (economy class) and hotel accommodation for two consecutive nights including the Awards night in April 2018. 3.4 The decision of the Judges and the the World Photography Organisation is final and no negotiation will be entered into with respect to any such decision. 3.5 You may enter a minimum of 5 and a maximum of 10 images. 3.5.1 Judging will be based on the portfolio of work. 4.1.7 Entries which contain any commercial content that promotes any product or service other than that of the World Photography Organisation. 4.2 You agree to fully indemnify the World Photography Organisation in respect of all royalties, fees and any other monies owing to any person by reason of Your breaching any of the foregoing. 4.3 You confirm that each person depicted in the Entry has granted permission to be portrayed as shown. Any costumes, props or other materials used must be rented or borrowed with the permission of the owner, and all other relevant permissions must have been obtained. 6. the World Photography Organisation may run an online rating process whereby members of the public may vote for a favourite photograph. If there is sufficient evidence (in the World Photography Organisation’s sole discretion) to suggest malpractice and manipulation of the rating process, then the World Photography Organisation has the right to remove the relevant Entry or Entries and, if necessary, award the prize to a different contestant. the World Photography Organisation’s decisions are final. 7.1 the World Photography Organisation recognises You, the author of the image, retain full ownership of the copyright in each Entry. (g) allowing viewers of the Website to view images on a computer screen, PDA or mobile telephone and store such pages in electronic form on disk or on a PDA or mobile telephone (but not on any server or other storage device connected to a network) for their personal, non-commercial use only. Please also refer to clause 9. 7.3 All entrants understand that the image information, including image name and description, may be shared with Event partners and media as per clause 7.1, 7.2 and 8. For the avoidance of doubt the “image information” does not include any personal information of You the author. 8. Any photograph used by the World Photography Organisation shall carry a credit line. Any failure to provide such credit line shall not be deemed to be a breach, as long as the World Photography Organisation uses its reasonable endeavours to rectify such failure within a reasonable period from the date of notice of such failure. 9 You acknowledge that it is your responsibility for protecting any Entry against image misuse by any third party, for example, but not limited to the insertion of a watermark. the World Photography Organisation and its Event Partners assume no responsibility and are not liable for any image misuse. 10. the World Photography Organisation assumes no responsibility for any incorrect, inaccurate or incomplete information, whether caused by website users or by any of the equipment or programming associated with or utilised in the Competition, and the World Photography Organisation assumes no responsibility for technical, hardware or software failure of any kind, for lost network connections, garbled computer transmissions, other problems or technical malfunctions with regard to the Competition. the World Photography Organisation assumes no responsibility for any error, omission, corruption, interruption, deletion, defect, delay in operation or transmission, communications line failure, theft or destruction or unauthorized access to or alteration of Entries. the World Photography Organisation is not responsible for any problems or technical malfunction of any telephone network or lines, computer on-line systems, servers, computer equipment, software, failure of any e-mail addressed to the World Photography Organisation on account of technical problems, human error or traffic congestion on the internet or any website, or any combination thereof, including any injury or damage to Your or any other person’s computer related to or resulting from participation or downloading any materials in the Competition. If for any reason a contestant’s entry cannot be viewed or is not capable of running as planned, including infection by computer viruses, bugs, tampering, unauthorized intervention, fraud or technical failures, the World Photography Organisation assumes no responsibility. 11. In no event will the World Photography Organisation, its parents, affiliates, subsidiaries and related companies, Event Partners, its advertising or promotion agencies, or its officers, directors, employees, shareholders, representatives or agents be responsible or liable for any damages or losses of any kind, including direct, indirect, incidental, consequential, special or punitive damages arising out of any contestant’s access to and use of the Website. Without limiting the generality of the foregoing, everything on the Website is provided “as is”, without warranty of any kind, either express or implied, including but not limited to, the implied warranties of merchantability, fitness for purpose or use or non-infringement. 13. All entrants must be able to supply a high resolution image suitable for printing in media and an exhibition should the image be required. 14. There are no cash alternatives available for prize winners. 15. Winners will be announced online. Promoter: World Photography Awards Limited, 9 Manchester Square, London. Building a small photography business bit by bit. Just happened to come across this whilst looking for something completely different on FaceBook – why does that happen ?. Steven seems such a level headed guy, of which there are many thousands of others all over the UK. Building his business from the ground up – bit by bit but always focusing on the quality of the output. I’m a husband and father of 3 beautiful children and I have more hobbies and interests than I have time for. My family means the world to me. I eat a lot of chocolate, drink tea and enjoy sports. I love to run when I have the chance. We have a dog called Buddy (the kids named him). I’ve been to University twice, once in Liverpool and once in Manchester. I studied Art, Photography and Teaching. I’ve been into photography for as long as I can remember. But only started shooting in a professional capacity around ten years ago. I worked as a primary school teacher and then took a job with an FE college before moving to a career taking photographs of people to pay my bills. I also deliver training and mentoring to other photographers. Featured in the Guardian Newspaper for my business success in photography. Photography Competition – Maybe you have the winning shot ? This is a BIG SHOUT out to any photographers out there that want to a chance to win some great prizes – including new cameras. Did you know that every week The Daily Telegraph runs a competition where , for example, the winner lat week got a Nikkon D3300 – not bad for easily emailing off a photograph that they took whilst on holiday in India. Our customers, of which there are thousands, may like to take up the Telegraph on their offer. It is very easy to enter. A great way to shoot superb high-definition photos and videos. The Nikon D3300 is small and lightweight, 24.2-megapixel D-SLR is powerful, comfortable to carry around, and incredibly simple to operate. The large image sensor captures the finest details with stunning sharpness, and superior low-light performance (up to ISO 12,800) frees you to shoot crystal-clear images in dark situations. Take a look at the video demo of it here. The prize is subject to availability though and if you win you may be required to take part in publicity – who doesnt like free publicity ? Especially as this usually means you have your image published in the paper edition of their Saturday Travel supplement. The best bit of advice we have heard from a few photographers , is to shoot images fresh for the competition theme at the time. This fires your enthusiasm, and critically, your imagination, and produces much better imagery more suited to the theme. These images tend to win more often than the images in your stock which you think “should be okay” for the comp theme. There are lots of photography competitions out there. They cover just about every style of photography you can think of. Some are judged by the public, while others are judged by an ‘expert’ panel. Let us know what other ones you have entered – and of course – what you thought about them. Sky Arts Artist of the Year 2017? We have lots of customers who are Artists of every genre – anything from pet portraits to landscapes. So maybe the recently launched Sky Arts Artist of the Year 2017? could be of interest – especially as there is a winning prize of £10,000 to win as well as many other prizes. Joan Bakewell and Frank Skinner will host both competitions. The judges are award-winning artist Tai Shan Schierenberg, independent curator Kathleen Soriano and art historian Kate Bryan. Please let us know if you have entered the competition and please keep us updated of how you get on. If you know an artist that tends to hide their talents and keep their work to themselves – please send them this page and encourage them to have go. Whilst walking around at the recent Roald Dahl celebrations in Cardiff – along with 80,000 others we took a short cut through one of the old Victorian arcade alleyways. There was all the usual unique and quirky joke shops, cheese makers, vintage clothing shops as well as some wonderful coffee aromas coming from a few nearby cafes. But, all of a sudden, there on the corner of a junction between 2 arcades something literally popped out, something that immediately catches the eye and entices you in to explore some more. That something was Jian Chen and it was her work that triggered the “I need to find out more about this artist” response. So we popped in to say hello and find out who , why, how and what. Originally from Chongqing China, when in 1999 China opened up , Jian decided to study English at Sichuan International Language University and later at Shanghai International Language University – becoming a qualified English/Chinese interpreter and translator. Moved to the UK to focus on Accountancy and gained a BA in Finance and Accounting at Glamorgan University. After securing a position as a Finance Assistant for four years she lost her job due to restructuring, and started to question what it was in life she wanted to achieve. She choose to follow her dreams and make a business out of it. The phone was placed on the counter set to record and then forgotten about. We love to find out the story behind the person and how they came to be where they are. So without a further thought to the children or the time I asked Jian about all the things that matter to her and how it inspires her work and business. We have just walked into your lovely shop and love browsing around your work. As we do that – can you tell us a little bit about yourself. What I’ve done yesterday made me who I am today. What I’m doing now is the only thing matters. I’m an artist, I live the moment and live the now. I do what I love and love what I’m doing. How would you describe your style of artwork ? My style of artwork is a combination of traditional Chinese spontaneous abstract and western realism. You wake up in the morning – where do you get your ideas from ? How long have you been painting ? Do you travel and if so do you exhibit your work anywhere ? Do you go to any shows ? What is the strangest thing you have ever drawn and why ? Thank you Jian it has been a pleasure talking and a welcome break from all the crowds in Cardiff. With the TV seemingly awash with cooking programs about baking, celebrity cooking, tradition British menus, “soggy bottoms”, cooking while interviewing etc. It was only a matter of time before the culinary arts were given some professional treatment by some fantastic photographers of every level and type. Step forward the Food Photography Awards, there is a category for just about every conceivable aspect here – ranging from street food, humanitarian food, fine dining, photography using mobile phones and even an under 18’s section. One thing is for sure the contestants really do put the effort in to make sure they capture the moment perfectly. The level of competition has certainly been taken up a notch this year. To be able to take great photographs of food is a well honed technique , which is why some photographers are fortunate enough to make a living out of it. But with smartphones readily available anyone can give it a go. In recognition of this mouth watering work each year there is the PinkLady Food Photography awards – Guaranteed to whet everyone’s appetite. As you can see – the subject matter can take just about any and every form. The awards cover each and every aspect of the process – literally from farm to fork, the preparation, the eating, the cooking and the human interaction on every level. Who would have thought a cheese toastie could win an award or even an Octopus on ice. The competition is judged by over 40 judges but Food Critic Jay Rayner is the overall decision maker. 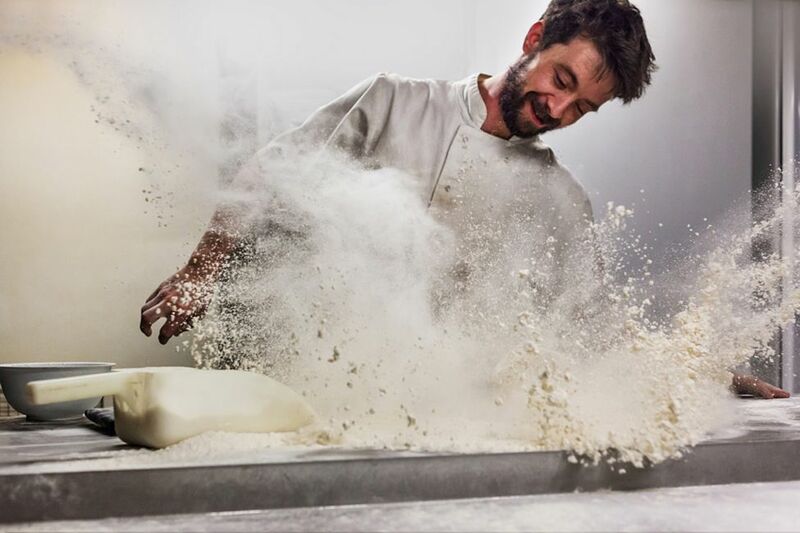 This years overall winner was Mark Benham – whose winning entry was a baker kneading dough, as Jay says “It’s a scene that gives you the smell of the bakery before the ovens are turned on.” There were 20,000 images submitted to this years competition. This proposal documents the results from the first sixteen participants and clearly shows the diversity possible using traditional photographic methods, especially given that all were produced using brands of paper and film that are either obsolete or discontinued. In many cases both. It is hoped that we will be able to exhibit prints from all the participants once the project is complete. All the material came from the darkroom of a painter, Bret Sampson, via his nephew David Yates who we thank for initiating what has become a fascinating exploration into the possibilities of the analogue photographic process. As Bret had spent much of his working life as an art teacher, it is sincerely hoped he would have approved of the inspiration and work produced by the paper he left behind. Every time I find a paper or film I like, they discontinue it. This piece of work is for a big collaborative project which is being launched in a photography festival in Spain next month. It will then exhibit in Cologne later in 2016 and then hopefully more places after that.